This is a studio portrait of a church youth group in Alma, Kansas. 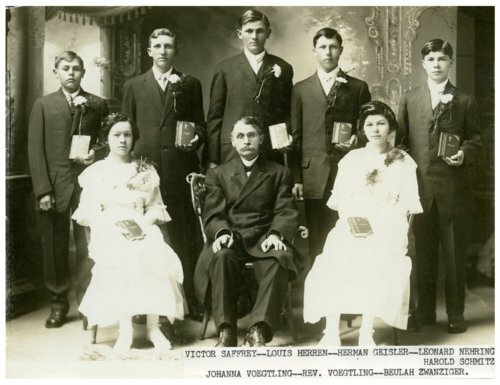 People in the photograph are identified as (back row, from left) Victor Saffrey, Louis Herren, Herman Geisler, Leonard Nehring, and Harold Schmitz; (seated on the front row, from left) Johanna Voegtling, Rev. Voegtling, and Beulah Zwanziger.